Hogan's Alley[a] is a 1984 video game by Nintendo. It was one of the first games to use a light gun as an input device. The game presents players with "cardboard cut-outs" of gangsters and innocent civilians. The player must shoot the gangs and spare the innocent people. Hogan's Alley was a shooting range on the grounds of the Special Police School at Camp Perry, a training facility for the National Guard of the United States. The Special Police School closed during World War II. In 1987, approximately three years after the release of the video game Hogan's Alley, the FBI Academy in Quantico, Virginia established a small, simulated city called Hogan's Alley to serve as a venue for training operations. A wall round of Hogan's Alley. The middle target is a gangster who must be shot; the lady and policeman to either side must be left alone. The game begins with three cardboard cutouts moving into position against a blank wall and turning to face the player. The cutouts display a mixture of gangsters and innocent/friendly people; the player must react quickly and shoot only the gangsters. In later rounds, the backdrop changes from the blank wall to a city block, with some cutouts already exposed as they emerge into view. The player is confronted with five cutouts in each of these latter rounds. After five rounds apiece in the wall and city block, a bonus round is played. Here, the player has a limited supply of ammunition with which to shoot up to ten tin cans thrown from one side of the screen, trying to bounce them onto ledges at the opposite side for points. After this round, the player returns to the wall rounds and the game continues at an increased speed. Shooting an innocent person, or failing to shoot a gangster, costs the player one life. No lives can be lost in the bonus round. When all lives are lost, the game is over. The game is available on the Nintendo Entertainment System and as a Nintendo VS. System Game Pak, which was installed into VS. System Arcade cabinets, both upright and the "Red Tent" Cocktail. The controls consist of a single light gun. This was a rather novel input device for a game of its time and added to its appeal. In the United States, Hogan's Alley released on the Nintendo Entertainment System in 1985 as one of the original 18 launch titles for the system. Here, there are three modes: "Hogan's Alley A" (the blank wall), "Hogan's Alley B" (the town), and "Trick Shot" (shooting soda cans to bounce them onto ledges). The game was included as part of an April Fools joke on IGN. The announcement said that the game would be ported to the Nintendo DS as part of the Classic NES Series using the touch screen as a substitute for the light gun. The announcement was only a prank. Parts of the game do, however, appear in form of touch screen-controlled microgames in WarioWare: Touched!, one of which is a longer microgame, and the game soundtrack is also unlockable for listening. Computer Gaming World named Hogan's Alley as 1988's Best Target Game for Nintendo, calling it "an entertaining variation on the theme". Digital artist Cory Arcangel hacked the Hogan's Alley game to produce "I Shot Andy Warhol," an art piece that replaces the game's targets with images of Andy Warhol. WarioWare, Inc.: Mega Microgame$: One of 9-Volt's classic Nintendo microgames is based on Hogan's Alley. Shoot the villains, but spare the innocents. One of 9-Volt's classic Nintendo microgames is based on Hogan's Alley. Tap the crooks to defeat them, but don't shoot the innocents. The boss of 9-Volt's microgames is based on the Trick Shot mode of Hogan's Alley. Keep the cans up in the air until they land on the small platforms. When the big oil cans appear, hit them until they explode, revealing classic Nintendo hardware. One of the unlockable Toy Room toys is a record player. One of the songs is Hogan's Alley Trick Shot music, that turns into a remixed version. In Super Smash Bros. for Nintendo 3DS and Wii U, Duck Hunt has the ability to kick the can from the bonus rounds of Hogan's Alley, which can be continually bounced forward by an off-screen shooter using the NES Zapper until it eventually explodes. 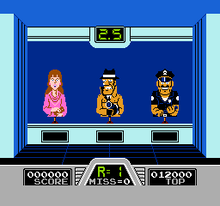 The character's Final Smash attack also causes opponents to get caught in the middle of a shootout between the enemies from Hogan's Alley and Wild Gunman. ^ Japanese: ホーガンズアレイ, Hepburn: Hōganzu Arei? ^ "Engaged Game Software". Intelligent Systems. Archived from the original on April 10, 2014. Retrieved September 14, 2009. ^ "Nintendo Vs. Unisystem Nintendo Vs. Dualsystem Arcade Manuals, PPU, PCB info, daughter board info, Nintendo Vs. Instruction Cards, game info,". www.johnsarcade.com. ^ Kunkel, Bill; Worley, Joyce; Katz, Arnie (November 1988). "Video Gaming World" (PDF). Computer Gaming World. No. 53. p. 55. Retrieved April 23, 2016. ^ "Interview with Cory Arcangel". Seeing Double: Emulation in Theory and Practice. Guggenheim Museum and Langlois Foundation for Art, Science, and Technology. January 1, 2004. Retrieved January 27, 2012. This page was last edited on 16 April 2019, at 18:28 (UTC).